Stafford's pieces can be used as table runners or transformed into placemats or kitchen towels. 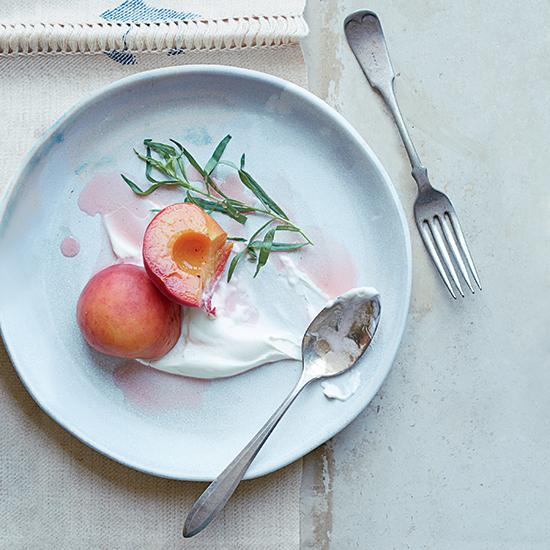 All week, F&W is introducing artisans who inspired the outstanding summer recipes from our August issue. “My relationship to the land and to the farmers is the fuel for my work,” says weaver Adele Stafford of Oakland, California’s Voices of Industry. Her newest textiles, her first for the table, use cotton from northern California’s organic Viriditas Farm, where the soil is fertilized by a flock of merino sheep and enriched by heirloom Sonora wheat crops. Designed as diptychs and triptychs, her pieces can be used as table runners or transformed into placemats or kitchen towels by separating the panels at the fringe that connects them to one another. Says Stafford: “My runners come to life in the kitchen when cut apart, which I’m really pushing. I’m eager to see what happens as they make their way out into the world.” From $385; voicesofindustry.com. This recipe is a fantastic showcase for superfresh summer squash. F&W's Kay Chun cuts zucchini and yellow squash lengthwise into long, thin ribbons on a mandoline and then tosses them with the hot pasta so they just barely cook. She created the dish after admiring the beautiful table linens by textile artist Adele Stafford of Voices of Industry. “The way the runner naturally gathers into loose folds looks to me like thin sheets of pasta," Kay says.